A majestic Walnut tree presides over this garden, nestled on the banks of the River Thames. 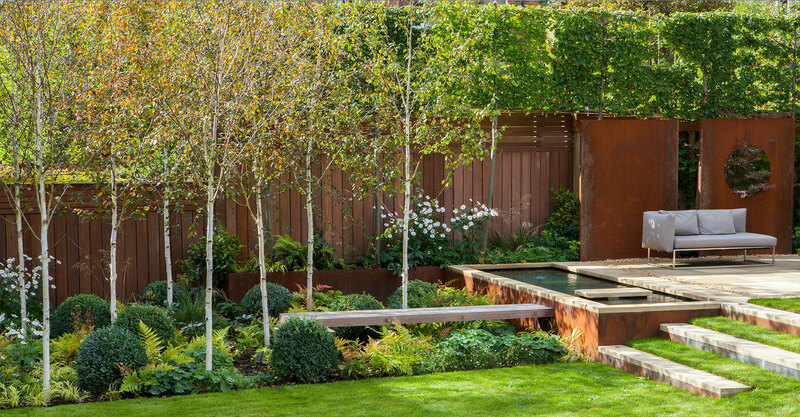 Cor-ten steel and sawn Yorkstone balance the contemporary and traditional style within this urban garden. The strongest feature of this terrace was the spectacular view that incorporates Hawksmoor’s Christ Church Spitalfields and Foster’s Gherkin, a real fusion of new and old architecture. The strong geometry within the garden plan utilises key focal views and lines out from the house. The feature rear zinc panel draws your eye and entices you out. The focus of the design was the view out from the kitchen. The geometry of the garden closely lines up with the strong asymmetric lines of the house walls and poured resin patio floor. London Garden Designer is a friendly, personalised design company, offering a comprehensive and flexible service across London, UK and Europe. Established in 2003 by qualified and experienced landscape designer Sara Jane Rothwell. LGD is enthusiastic, practical, collaborative, and cost effective, which combined with a meticulous attention to detail, informs a diverse portfolio of award wining gardens. LGD has become known for its slick city gardens and roof terraces and has appeared in numerous magazines and books. Sara Jane trained in Horticulture and Garden Design and brings to her gardens a further 11 years design experience from her work in Film and Theatre. In 2006 she became a registered member of the Society of Garden Designers (MSGD), dedicated to maintaining standards of professionalism within the field of Garden Design. She is also a BALI registered designer. Francesca trained in architecture at the University Institute IUAV of Venice. After completing her master’s degree in “Architecture and Innovation” she moved to London in Spring 2017, where she developed a passion for garden design and landscape, working at del Buono Gazerwitz. Francesca joined LGD in Autumn 2018 and works alongside Sara Jane on a diverse range of Landscape projects.